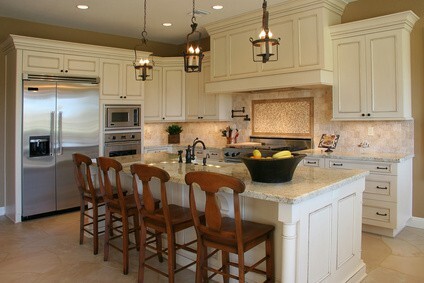 Despite their prominent position within the kitchen, cabinets receive much less attention than they deserve. They are among the defining elements of a kitchen’s aesthetic value, and the source of much of its wrath. Between children that have a tendency to slam the small wooden doors and the grease splatters that seem to go everywhere, cabinets take more than their fair share of abuse. When the signs finally do begin to show, a common mistake homeowners make is that it’s time to replace the kitchen cabinets. Our professional Minneapolis, MN painters, however, are prepared to offer a different take on the situation. Don’t Spend a Fortune On New Kitchen Cabinets! When a homeowner believes that it’s time to replace their cabinets, they often prepare to spend tens of thousands of dollars on a project that usually isn’t even necessary. If this sounds like you, you should consider kitchen cabinet painting as an alternative to replacement. Often, a fresh coat of paint is all that is needed to rectify small cracks and ruined paint. Our expert Minneapolis painters can provide a thorough inspection to determine if expensive new cabinets are necessary or if a quality kitchen cabinet painting project will do the trick. If a fresh coat of paint is sufficient to repair cabinets, we will work closely with you to provide the desired results. This may include customized colors to fit a kitchen’s specific style and a specialized finish for enhanced aesthetic value. You may be pleasantly surprised by how much better a kitchen cabinet painting project will improve the room’s look. You may be even more pleased to find out how much such an affordable project can greatly improve the value of your home. Through their years of experience, our Minneapolis, MN painters have developed a deep understanding of the importance that safety plays within any kitchen cabinet painting project. We understand that food and drinks are prepared here, and take all measures to ensure any sanding debris and leftover paint are properly contained and disposed of. At no time will your dishes or food be exposed to dangerous chemicals. Since we utilize the highest quality primers and paints, not only will a kitchen cabinet painting job drastically improve aesthetics; it will also enhance the durability of cabinets. This is among the greatest benefits, as cabinet replacement projects can easily exceed $10,000. Cabinet doors and shelves will be better protected against wear and tear, and the wood underneath will age much more slowly.